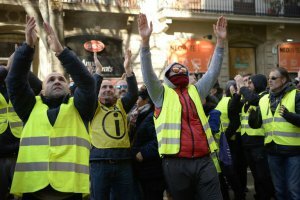 Barcelona city centre remained blocked by taxis on Tuesday as the drivers’ strike to demand tougher regulation of ride-hailing firms, such as Uber and Cabify, entered its fifth day. In Madrid, the indefinite strike that started on Monday saw hundreds of striking taxi drivers gathered in the central Sol square outside the headquarters of the Madrid regional government, as a police helicopter hovered overhead. Some set off firecrackers. The Madrid taxi drivers’ strike comes just two days before the start in Madrid of the Fitur international Tourism Fair, one of the world’s largest. The Catalan government will meet taxi drivers’ unions and ride-hailing associations throughout Tuesday, although a compromise is seemingly unlikely. The largest taxi union’s spokesman, Alberto ‘Tito’ Álvarez, has rejected sitting at the negotiation table with representatives from Uber and Cabify. ‘There’s nothing for us to negotiate with them,’ he said. After five days of protests in Barcelona, including clashes with police and attacks on ride-hailing vehicles, taxi drivers are keeping up the pressure. 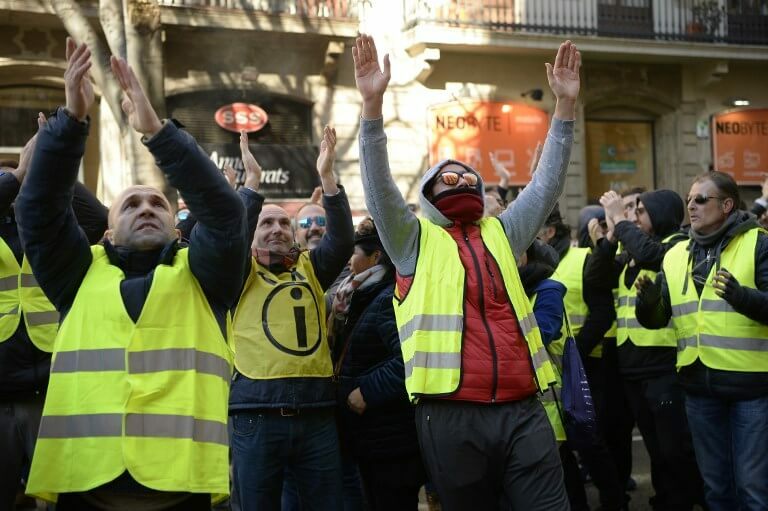 Drivers took to the streets on Monday wearing yellow vests – in reference to the protest movement that has plagued France’s president Emmanuel Macron. Álvarez has also said that taxi drivers are in contact with the French movement’s leaders, opening the door to blocking Catalonia’s border with France, one of the main points connecting Spain with the rest of Europe. A meeting between Álvarez and Damià Calvet, Catalonia’s territory minister, ended on Monday without much progress. In an interview with Catalan radio, Calvet accused taxi drivers of ‘using violence to blackmail’, and warned them that public opinion in Catalonia is not behind them. In Barcelona ride-hailing app drivers held their own protest, partially blocking the central Avenida Diagonal with their black vehicles. They are angry about new regulations unveiled Friday by Catalonia’s regional government forcing clients to book their services at least 15 minutes before the actual time they are needed. The measure has also upset taxi drivers who argue that ride-hailing services are not a taxi service by law and should therefore be booked 12 to 24 hours ahead of time. The president of Catalonia’s Unauto ride-hailing association also took taxi drivers to task for using violence to protest. ‘There is a fortunately small but violent group of taxi drivers, who are doing a lot of damage not only to us but also to their colleagues, who are using mafia-style tactics to achieve their economic goals,’ said Josep Maria Goñi.